Discussion in 'United's Women's Team' started by Andersons Dietician, Sep 10, 2018. So I’d imagine anyone who has been watching the United ladies will have seen her and must be impressed. She just has something special about her, composed, strong, can play off both feet and has a surprising turn of pace. I think it was against Reading but she was cornered twice by about 3 players and somehow found her way out and looked like it was nothing. Was just watching the BBC woman’s football show and Alex Scott mentioned that she could go on to be the best player in England, she has all the talent it’s just the mindset and her having to realise she has to work hard. (sounds familiar to another midfield maestro we have) she does at time kind of look like she isn’t giving it her all kinda just casually jogging about but then she gets the ball and more often than not does something good with it. What are people’s thoughts on her? I heard she's one of he best in the world for her age group? Don't know much about the women's game but I think America is the highest level for them and all the best players end up there at some point. Anyone know the contract situation and do we have a chance of keeping her long term? She’s powerful and technically gifted, much like her brother. I think she might struggle with stamina like Yaya and Rom do, won’t be running for 90 minutes. Incredible for 16 though! She's been very very impressive. 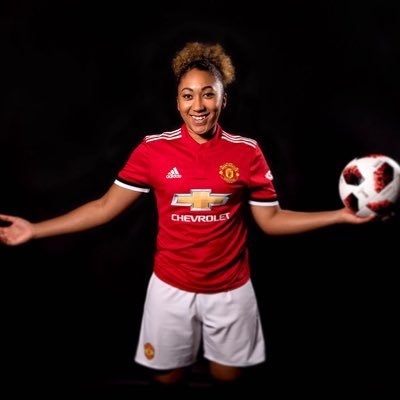 With her strength, her stride and technique making her able to pass people sometimes at will, hitting long passes well and has a good shot on her, it’s very hard not to think of Pogba right now. She somehow seems more disciplined, like Pogba for France. Maybe because she’s young and has less onus on her to be the main woman, while Katie Zelem is clearly the maestra in the midfield. (Then again, maybe Pogba would also benefit from having someone he could accept as a clear maestro beside him?). It was striking against Villa how she seemed to be able to do what she wanted the first 20 mins, whereas she disappeared more and more relatively speaking to someone like Kirsty Hanson, who held a show in the second half. Doesn’t have to be a bad thing in a 12-0 game, mind you. ‘Baby’ James is going to be very interesting to watch, the closest thing to a Duncan Edwards talent in this side. Alex Scott mentioned that she could go on to be the best player in England, she has all the talent it’s just the mindset and her having to realise she has to work hard. Alex is presumably talking from a position of knowledge from Arsenal there. At a guess, Lauren found youth football too easy! She made her first team debut for Arsenal on her 16th birthday. At the moment, watching her, what I see is a lot of talent but not yet ready to play full tough matches in midfield. Maybe that's a physical thing and she gets tired, or she needs to pace herself better, or a question of concentration - whichever one it is I'd summarise as "she's 16". She needs games and she's come to us to get them. If she also needs self-discipline and self-motivation then I hope she finds it in United's setup. It's an exciting time at United, so I would think that's helping her. Maybe in February, when the novelty wears off and we're into the routine, it'll be harder. She's got plenty of time though. America has a well established and successful women's game. They offer college scholarships to 18 year olds and a number of English players go there for that reason - Leah Galton did. Some older players who wanted to try life in the US and to play professionally went there as well. However the standard salary cap is $44k (with the whole squad cap set at $350k) so wages won't be the driver. The US national team are centrally funded, and some of them have good personal sponsorship deals - so they get paid a lot more, but that doesn't really help foreign players much. It's still very early days for pro women's football in England (and Europe generally) so it's too soon to say what will happen to the teams here and whether the financial model will (in time) become sustainable. Meanwhile though, I doubt the US will have much pull on Lauren, unless she wants that US college experience. Right now, a bigger factor in her life is probably her brother Reece James. He's on loan from Chelsea to Wigan at the moment. I guess her family are happy the two of them are based in the same area. When he heads back to London (or wherever) Lauren's situation will presumably get more complicated. Some older players who wanted to try life in the US and to play professionally went there as well. However the standard salary cap is $44k (with the whole squad cap set at $350k) so wages won't be the driver. The US national team are centrally funded - so they get paid a lot more. Isn't European football the pinnacle, with Lyon being the most important club? I'm I correct in thinking that contracts are shorter in women's football and players more about more freely so we shouldn't get too attached to players? Yeah she did hold her own against Reading and Liverpool but I saw Arsenal, Chelsea and Man City yesterday and it looked far more competitive than what I would say we’ve experienced so far so it would be intresting to see how she would do week in week out with all that pressure against good sides. WSL2 for us and her is probably perfect right now, like an extended pre season basically, she gets the games under her belt, experience and so on. I just hope there are tougher challenges than Villa for us and her in the league. Weird that the former Manchester United youth product Reece James played for Wigan and moved on this summer to Sunderland and they replaced him with another Reece James who’s sister now plays at United. Hopefully the league becomes more structured and just becomes more professional looking but I guess that depends really on the teams and if they can continue to have a woman’s football team or if it can become self sustainable. Hopefully this way we’ll start to tie people down to longer contracts and so on. The thing about Europe is that it's in transition. Lyon are a successful pro team but their CL crowds average about 10k. At the moment it's the national teams that are drawing the sponsors, the TV audiences and the crowds. International football and the men's game are subsidising the women's pro game. It's changing though. Personally I think women's football (international and club) has improved massively in the last few years, basically since more club teams went pro. The women's FA Cup final got a crowd of 45k. What's this got to do with Lauren? Well, I do believe that United are game changers in a game that was already changing. If she wants to become a star she's in the right place. Contract length and players moving frequently really comes down to unstable clubs, and a lot of players (historically) having day jobs and needing to balance family/football/finance to live. Again, if Lauren lives up to expectations, and the pro game continues to grow, she may not have to keep moving. When I saw Chelsea tied down Fran Kirby and Millie Bright in 3 years contracts I said wow. Chelsea are in a good place and will dominate women's game for a while. Lauren is in the right place now. She will get plenty of playing time and forgiving fans but still people will pay a lot of attention to her. Hope she fulfills her potential with us. Agree with this. We had record breaker crowd in the first home game. Villa vs United crowd is at 1100 with many traveling fans. The United effect is well and truly in place. Mourinho will fall out with her and she'll be off to thrive elsewhere. Stay on topic. Stoney manages the women's team. Fran Kirby really is something of a player. If Lauren James can reach her levels, I hope she’ll do it at United. Still amazed by how she plays the game, incredible talent. Interesting to know esp about family dynamics. Lauren apparently is right footed but her left isn't bad. Also a bit about Reece already got a Mercedes and Lauren believes there are clubs that pay women players good money. Lauren sounds very determined, and very confident. I think she's right about the money as well. She looks like she could be world class, and she's arriving at a time when that will be rewarded - not just with wages, but with sponsorship deals as well. A reminder though, that we might lose her through no fault of our own. It suited the James family for her to move up here when Reece did. If he does return to Chelsea next season, it'll be harder for her to stay. Dad may want to help both his teen-agers for a while longer yet. Of course, there's always Reece himself - anyone know a local men's team that needs a right back? This can’t be allowed to happen, give her Sanchez wages I don’t care she has to stay. If she likes her brothers Merc I’m sure United can sort her out with a nice Chevrolet, a Camaro or something. On a more serious note she is right, the way the game is going there will be lots of opportunities for female footballers to make money. The size and name of this club you would think United is a good place to stick around and have an opportunity at that but I doubt that is really her only motivation. Just hope that her father thinks United is the best place for her and the club need to do everything they can to convince him of that. Among a team of hard working professionals she is a little gem that can unlock defences. She has great touch on the ball and strikes fear into the opposition. Was just watching the highlights and was thinking something similar. In a team of very good players, like Zelem,Arnot, Hanson and so on she still stands out as something above them, she just makes everything look so easy and simple. Her goal yesterday from start to finish of that move everything she did was class. She has to be in a shout of making the England squad for the She believes Cup. She’s incredible. The passing, the vision, the runs, the strength, skill, finishing just an absolutly class player. Her 2 goals today, the run just showed her strength and power but the other was a really good finish. Class any time I’ve watched her. Didn’t see the game today but must check out the highlights. How good is this girl? She's extraordinary - so much talent. Not quite the finished article, physically or tactically, but if things come together for her, she'll be genuinely world class. Hopefully she'll be winning WSL matches for us next season - it would be awful to see her doing it for someone else.